Once the battle begins, there is no fleeing. It has three types of punches, so figure out which it will unleash and choose an appropriate strategy. Its tackling punch is powerful, so defeat it quickly with successive reaction commands! It shoots bullets from midair, but only in a forward direction. Its movement speed increases when retaliating, so defeat it while it's flying slowly. Its swiftness makes it hard to attack, so wait until it is still before attacking. Use magic to stop its movements. Avoid its retaliating tackle kicks by using the reaction commands! It charges its target in a group. Use the reaction command Rising Sun when it jumps into the sky, as it is about to unleash a tackling attack. Use Rising Sun in succession for various combos! Bolt Reversal 100% Being caught in their laser attack Rapidly press the button to refect the beam back at the Heartless. If caught by it's snag laser, use the reaction command Bolt Reversal continuously to escape. If successful, a big explosion will unleash damage upon nearby enemies. A great mage who can handle all three types of elemental magic. It bears a striking resemblance to Red Nocturne, Blue Rhapsody, and Yellow Opera when changing stance for use of each magic. It is immune to all magic, and should be defeated immediately. A rare Heartless that can be found in certain worlds. It appears when you poke around various areas of the map. It only appears in certain areas, and once it appears, it will not appear in that area for a while. Use the reaction command to get items. Figure out its secret pattern to get specific items. It shoots bombs from afar, so defeat it immediately. Avoid areas of potential bomb drops while attacking. It runs off when approached, so follow it closely and defeat it. Root Ravager 200% Sora stands on the root shortly before the Heartless starts to attack It rips the plant from the ground, which creates a shockwave, injuring nearby enemies. It stays in place and shoots seeds. Use reaction commands when it counterattacks with its roots. Use Root Ravager to uproot and attack surrounding enemies at once! It restores the HP of surrounding enemies. Use Heal Stomp with the right timing to heal the party. When attacked, it may call for help, so be sure to defeat it immediately. It chases its target with determination while scattering mines, so be wary when fighting this creature. When its HP gets low, it places a large mine. Avoid it before it explodes. It easily resists magic, so don't be shy about using the Keyblade! It can fly around or transform into a tank. In the air, it follows its target around, so keep a fair distance. The tank attacks from afar, so close in while dodging the cannons. Watch out for the electric attack unleashed during its transformation! It moves underground, so follow the clouds of dust for its position. Use a finishing move to lure it out of the ground. Attack when its face pops out of the ground! Attack from a safe distance, while watching out for it's sudden tackle. When its HP gets low, a tornado forms, drawing the enemy close. Immune to fire magic, it parries most attacks dealt from the front. Use the Rush attack from behind and defeat it with a combo attack. Parry its fire bombs for a chance to unleash Full Swing! It runs before it attacks, making its movements easy to read. It has little HP and is weak against ice. Use ice magic to defeat it. Clear Shot 600% After it throws an ice attack at Sora, a timer will appear above his head. When it reaches one, the Reaction Command will be avaliable. Sora hits the ice back at the Heartless. It uses and is immune to all ice magic. When its HP gets low, it uses magic to try to freeze its target. Try counterattacking with Clear Shot. Although it looks like an ordinary statue, it attacks with no warning. Immune to magic, it is skilled in ranged attacks. Fully avoid its spinning attacks for reaction commands. If timed well, it can be defeated in a single blow. It boldly approaches its target, but catch it off guard after it attacks. It summons persistent ghouls when it turns into a headstone. Defeat it before it has a chance to call forth these annoying ghouls. It taps the ground to create a sonic wave. Jump to avoid the wave and defeat it with combos. When its HP gets low, it attacks with a series of tackles, so defeat it immediately! Bat Cry 100% The Heartless swoops down, preparing to attack. Sora hurls the enemy around in circles, damaging the surrounding enemies in the process. It generally flies around scoping the area. When it swoops, use Bat Battery to capture it and attack surrounding enemies. After this attack, use combos while in the air to defeat it. It attacks and withdraws quickly, making it hard to hit. Use magic to defeat this enemy. When its HP gets low, it moves around even quicker, so be sure to defeat it as soon as possible. It jumps before it attacks, making its movements easy to read. It has little HP and is weak against fire. Use fire magic to defeat it. Lance Tug 200% When it runs around the area randomly Sora grabs the lance it carried, smacks it around a bit, hitting nearby enemies, then slams the enemy into the ground, which creates a shockwave. 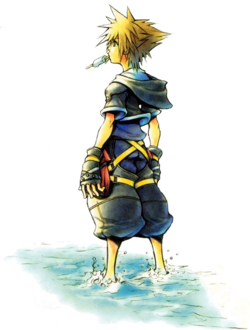 Guard -> Kickback 50% Slide on its belly when its HP is very low Sora stops the advance with Guard, then hits it backwards with Kickback. Full Swing 400% In the air after a combo or Kickback. Hit's the enemy with the Keyblade. It will block attacks dealt from the front, so a good option is to perform a series of combos from behind, finishing with Full Swing. When enraged it will repeatedly tackle it's target. That's the time to use reaction commands. Use Kickback to finish the battle! Rodeo -> Grand Cross 100% Sora is nearby, the enemy isn't doing an attack, and there isn't a Shaman already riding it. Only avaliable in Pride Lands. Sora jumps onto its back. Can then ride it and attempt to damage nearby enemies. Afterwards, Grand Cross is used to damage the Heartless itself. Make sure to dodge its strong attacks as they deal huge damage. Weaken it instantly by crushing its head with the reaction command! With a shaman, it powers up to unleash deadly curses, but merely defeat it as you would a shaman. It backs away during combat, so close in with thrust attacks. Catch it off guard after parrying its attacks to defeat it. Quick Blade 200% Whilst running at Sora in an attempt to ram him. Countered with the Keyblade. It moves in a clockwise motion around its target, so keep that in mind when attacking. It moves swiftly, so attack in the few instances it shows its movements. Keep an eye out to avoid and counter its high-speed tackle with Quick Blade. Dodge Roll 300% The countdown above the enemy's head reaches either 3 or 2. Sora rolls away, and the Heartless damages nearby enemies. When attacked, it counts down for self-detonation. Use Dodge Roll seconds before the explosion to lure surrounding enemies into it. To play it safe, parry its tackles to make it lose its will to fight. Bump -> Meteor Spike 200% Lauches any attack at Sora from the air He parries the attack with Bump, then slams it into the gound multiple times with Meteor Spike. Wind Dance 10% Sora counters the attack.. It produces a shadow on the ground before attacking. Catch it off guard right after it attacks. Once it tries to jump and attack, use the reaction command Aerial Dance for a flurry of attacks! It jumps around while attacking persistently, so attack it and defeat it immediately. Watch out for its powerful counterattack. It won't move until approached, so move in swiftly and attack. It becomes tired and lets its guard down after counterattacks. Attack then for an easy battle. Speed Trap -> Aero Blade 10% The Heartless jabs itself towards Sora Blocks the attack with Speed Trap, then attacks with a whirlwind using Aero Blade. It attacks in a group, so be ready to attack with reaction commands. Start with Speed Trap, followed by the wide Aero Blade attack. It chases its target with determination when counterattacking. Run! It sinks into the ground while moving, so timing is the key to defeating it. The moment it surfaces, attack away! Dispel 100% Small blue lights surround Sora. They can be used against nearby enemies up to 5 times in a row before the manage to attack Sora. Shift Shot 25% The enemy changes itself into an energy orb. Sora hurls the orb at other enemies, damaging the Heartless in the process. Cyclone 400% After taking a hit, it glows and lunges towards Sora with its legs outstreched. Sora dodges and lauches a counter-attack. It unleashes decent attacks from every angle. Stay alert when fighting it! It counterattacks with a kick, so retaliate with Cyclone to float in midair and unleash combo attacks! Make sure to close in, as it attacks far away targets with a laser. Snag -> Sparkle Ray 1,000% It deplys a double or charged laser, or has one of its beams reflected back at it. Sora attacks the Heartsless with Snag, then can target other enemies with a ginormous laser beam by using Sparkle Ray. Use reaction Commands Snag, then Sparkle Ray to attack surrounding enemies with a laser! Keep an eye out for opportunities to use reaction commands even if the laser attack is parried! Tornado Ride 100% It spins on its axis whilst heading towards Sora. Sora grabs the enemy and uses the whurlwind to attack nearby enemies. It attacks as it moves, so once it starts spinning, stop its movements with reaction commands. Use Tornado Ride and grab the enemy for a free ride while attacking surrounding enemies. It merely sits and waits for the enemy to come closer, so attack from afar. When it turns into a box, it begins to attack from a distance, making it impossible to close in on. It has two faces, both of which need to be fought differently. When in the air, move in close to seal its long-range attacks. When on the ground, move far away to avoid its short-range attacks. It merely wanders around, but once attacked, it attacks persistently. Parry its attacks to ward it off. This page was last edited on 6 March 2019, at 19:01.